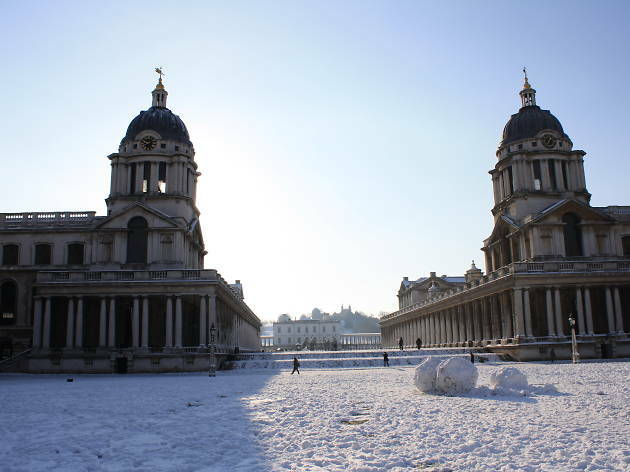 Move over Winter Wonderland, there's a new Christmas experience in town: Greenwich Winter Time Festival, a snowy festive takeover of the world heritage-listed Old Royal Naval College, located right beside the Cutty Sark. The space in front of the riverside building will have a covered ice rink, and a Christmas market filled with contemporary craft and design stalls. Don't worry, it's not all ulta-modern: there will still be food stalls flogging mince pies and mulled wine. Entry is now free, though it'll cost extra for ice skating or an audience with Santa. Greenwich is pretty Christmassy as is, so Winter Time is a chance to go turbo on the festivities this December. Awful. What a rip off. Went today and there is almost nothing there. An ice rink, a pantomime tent and 5 food trucks serving up that oh so festive fayre of burritos, churros or burgers. Not worth £5 let alone the £16 they charge. The market is a Hodge podge collection of handmade clothes, nothing you'd associate with Xmas and santa does group visits, so you can get a wonderful souvenir of your child and 8 strangers with santa. Very, very disappointed in this - didn't feel festive in the slightest and felt it was very much done on the cheap. Save your money, don't bother. I feel like we were robbed. Way over priced for what you "get". I now know why its called a Wintertime Festival vs. using the word Christmas because there really was nothing Christmassy about it. The ice skating show was mediocre, nothing festive about it. A few men and a woman in black track suits. Couldn't they dress a little more festively? The "Big Loo Role" show had nothing to do with Christmas either. None of the stalls seems to be selling Christmassy items, nor were the food trucks. At least there was mulled wine and cider! There was loads of empty space in an already small area, why? And talk about false advertising. I went because I was eager to see the "most Instagrammable" market but I literally took ZERO photos. And they talk about all of these shows going on and performers walking around. We saw one Snow Queen and a couple of human Xmas crackers. Meanwhile, there were lots of employees standing around doing nothing. (Put them in costumes!) Attendance was definitely lacklustre. I'm guessing they expected much larger crowds, hence all of the employees. We spent over £50 just to enter the space and go ice skating. Complete waste of money. Glad we didn't pay for Santa or I'd be livid, as another reviewer said, your child doesn't get one on one time with Santa. What were the organisers thinking?! FAIL!! Don't waste your money on this event. We visited on Saturday afternoon, 2 December and were really looking forward to it, being big fans of Greenwich. Tickets cost £16.53 each to get in. There is a big ice skating rink and a display was on when we arrived at the beginning of our slot. The music was uncomfortably loud and I couldn't see a thing due to numbers of people at the front. If you want to skate, that costs extra. We moved on in search of the 'market' which consisted of about 20 stalls selling Ok stuff, but not a patch on the resident Greenwich market outside. There are food stalls and tables, but again, there are food stalls everywhere outside. The silent disco was silent. THe entertainment marquee contained a few kids with their parents but was fairly uneventful. There was a queue of children for Father Christmas but I cannot comment on the quality of that experience and presume that also costs extra. Our visit lasted about 10 minutes max, we then returned to the markets in the town which are always there and are always good. I've looked at the pictures posted of the evening entertainment and it may be that there's more going on in the evening and that all looks magical at night, but my advice would be to save your money and stick to the town outside. This really is a rip off and I was really disappointed. I feel totally scammed. We booked in advance, £80 entry for two adults and two small children with ice skating included. The entry worked out to about £17 each which is a lot for the childmtickets, When we arrived we were told that the event had been made free entry for all and that I needed to email Sean the box office manager for my refund. In hindsight I should have insisted they refund me on the spot and refused to leave until they did. Several weeks after my email I received a total of £36 but not until I continually emailed to see what was hapeemimg with my money. I am not happy obviously with this amount so I emailed again today but the email and website have been taken down. Now what? I want my money and feel I have been robbed. Stay away. Ice skating and winter markets are almost as common as summer festivals in London in the summer now. i had high hopes for this festival as it's in one of my favourite locations in London. But the way they designed the area you couldn't even see the beautiful naval college and the ice skating rink was small. Some of the shops were cute and we did buy a few bits, also the skating show was lots of fun but very short. I don't think I would pay the admission fee it was expensive. There are much better winter festivals in London. This was an okay winter festival- glad I didn’t pay for it though! Very quaint in its winter feeling and I did enjoy wandering around the few stalls they had- a tad on the expensive side! The ice skating was okay, but the people didn’t seem very friendly or that they wanted to help you at all, I was given my skates with not even a smile or an explanation of how to put them on! That was a little disapointing. The musical entertainment was lovely, I loved coming out of the ice rink and hearing the Nordic carollers- that really did put me in a festive mood! I hope that next year they can iron out some of the teething problems that come with a new festival, because it did put me in a Christmassy mood and I would go back again! After suffering from bad reviews on social media, the management of this festival scraped the admission fees. Thankfully I was invited to this event and did not have to pay, thus I rather enjoyed my time there. The place is small and there is not much to see and do. The limited number of stalls were selling accessories, candies, usual Xmas market stuff geared towards kinds, and the food truck were selling overpriced food. The only real entertainment was a small skating rink with not much atmosphere. For kids, if you wanted a picture with Santa (just the kid and him), forget it - the Santa would only take a group picture. My advice is if you happen to be in the area, go and check it out, but if you have to make your way there from far away, you would likely be disappointed. I went along to this with 3 adults and 3 children including a small baby. What a disappointment for all! For £16 per adult it certainly is not worth the money, especially when the majority of the stalls were closed, the food options were limited and the entertainment very low quality and there was no where to get kids warm, including no warm baby changing facilities. We went on snowy Sunday so i understand that not all stall holders could make it, however I feel that the organisers should have pre warned customers or at the very least sent out an apology afterwards. Quite the opposite happened, I have sent a complaint including a request for a refund to the organisers and 2 weeks later still haven't had a response. Very very poor!! Bought this as a festive family treat! We went for the evening on saturday along with about 100 other hardy souls. We were all very disapointed exept my 4 yr grandson who loved the ice. There were only 3 stalls still open and 6 food outlets selling very overpriced fare. The music was ok but if you want to attract families Greewich, do something like rides etc . We wont be back!! I am all for alternatives to Winter Wonderland but Im afraid I cant mark this any higher due to the cost associated with it. £20 per ticket to include ice skating is extortionate. The Royal Naval College is such a beautiful back drop yet the ice skating is in an enclosed area and can't really see anything. The rink needs to be slippy but they dont have a machine that does that for them. If anything i feel sorry for the stalls that are there. The vendors are eager to lull you in but as not much footfall its hard for them to make any money. I did enjoy the entertainment though, was very fun and nice to see a bit of break dancing on ice which is different. There is a santa show which lasts about 15 minutes and the kids get a little goody bag. I thought this was quite cute and well put together. Really poor event. The £15 entrance fee gets you nothing - everything inside is an extra cost - the bar, ice skating, the food trucks, the gift stalls...and that is it, nothing else (well apart from some christmas carol singers which were nice)! I was done after about 20 minutes and left. Its a shame as the location is fantastic. The signage to get to the event is also non existent and I walked around the whole perimeter of the venue before finding the entrance. I've given it a 1 star, although I would have probably given it a 3 star review if it was free to get in. I'd say give it a miss until they have sorted out the pricing and head to Winter Wonderland instead. It gets one star for the figure skating which was good (I felt sorry for them and the place you skate in has little that is festive, no decorations, some unlit trees scattered about and no Christmas music. The whole place really isn't festive or Christmassy at all. Its incredibly expensive, and thereI is very little in there. The normal market in Greenwich is far, far better. Even the stalls were poorly curated. It appears as if little effort has gone into it. Even the staff looked bored (some were a bit aggressive with my son, 6, when we were standing near the skating rink to see the show because of where he stood, which upset him and there were no warning saying you couldn't stand there). Do yourself a favour. Go to Greenwich, its lovely, but avoid this overly expensive Winter Time Festival. It's really, really poor. I really wanted to disagree with everything everyone was saying below but I'm afraid I can't. At a cost price of £20 including ice-skating, it is being extortionate. That's only for a half hour of skating too - not an hour which is the norm elsewhere. Billed as a festive wonderland, it fall somewhat short of that. Now don't get me wrong, there are a lot of cute little huts selling locally soured products, but they just don't feel festive enough to me - how about replacing the pure white metal huts with wooden ones to give it a more Winter Wonderland kinda feel? Food selection is megre - only 3 stalls from what I saw, none very christmassy. Drinks are also quite expensive - £6 of a glass of bubbles, and the flute is very thin. You would expect food and drink to be slightly elevated if the surroundings and atmosphere warrant it, but this simply doesn't. As the below suggests, this is a seriously pricey hour or two of evening entertainment to be had in a fairly nondescript corner of Greenwich. I was lucky enough to attend on a press night when a few free drinks were flowing and a session of ice skating was included but I know that despite the high entrance fee to this small festival, absolutely everything else comes at an extra cost. Having a stage with a performance schedule including local choirs and ensuring that only local makers stock the few market stalls that there are would be two redeeming factors here but that's about it. The bar is expensive and all open-air, freezing even when stood directly under heaters. The quality of the food trucks is good and there's a mix of cuisines on offer but not nearly as much choice as I had been expecting. The professional dancers on the ice are a unique touch and it was entertaining but doesn't make up for how flat the rest of the experience left us feeling. Went today with snow on the ground. The rink itself is covered, which is a good thing for sleety weather. The ice rink show was entertaining and demonstrated some nice ice acrobatic ability from the performers. The festival isn't really worth the entry fee, the enclosed area has been decorated with a lot of xmas trees and a few lit cut-out installations, but that is about it. I felt sorry for the retail and food outlets as the high entrance price will reduce the foot flow for these people. A comment for the organisers, charge for the ice skating but the not the entrance, it is far too high and will deter people from coming. I traveled all the way from NW to SE with high expectations only to leave it in less than an hour and quite disappointed. There was nothing "unique" about this festival. No matter how many critics it has, Winter Wonderland is by far the best Christmassy festival in London in my opinion. The ice dancers' show at the beginning was entertaining. The ice rink was pretty much the only activity you could do. Apart from that, there wasn't much going around. The lights weren't set up beautifully. The Christmas market lacked the element of festive products. And the food options were not that great. There was only this Father Christmas launch pad which I didn't get the chance to explore. I've heard it's in huge demand of children. A lot of improvement is needed if they are going to run it in the future years too. With winter wonderland in town everyone wants to make their own version I guess.... this just missed the mark in my opinion. Firstly... there aren't enough activities to partake in. Apart from Ice skating and watching a choir or two that's it. The food vendors there were some I haven't heard of before but looked really Good! The bar is stocked well so one can indulge in an array of drinks but the stalls weren't selling Xmas related things . One sold corner store sweets whilst another sold baby clothes.. I did find one which sold vegan sweets and cakes though! Fantastic addition if I might say and the mince pies were delicious (according to my vegan mother)... overall the fair had more pine trees than distractions... it needs a lot more work in order to thrive. The first thing to say about this Winter Time Festival is that it's bloody hard to find! Coming out of Cutty Sark tube station and walking towards the big tea clipper, I thought we had got the date wrong to the press evening as there was no signage and some stalls were being set up. I then asked around and found out it's in the Royal Naval College grounds round the back, so eventually found the entrance. Our night was free to go and look around and we got some free champagne, canapés and mulled wine and could look around the pretty little stalls, enjoy the silent disco and watch the ice skating freestylers and have a go on the ice ourselves. We even got to try out the Father Christmas show which features a projected gauze over Santa and his sleigh and a bit of education about how he flies around the planet to deliver all the presents. You even get a group photo with him! The Mirror Stage also features a covered tent area with bar and entertainment. There was a choir which was very 'homely' and a DJ called Wendy who seemed to clear the area when she started playing what she thought people wanted to hear. Maybe it will be busier on a weekend! One thing that I'm startled about is it's £15 entry for adults and £8 for kids, then everything in there still has to be paid for! Ice skating is an extra on top! It's a little steep if you don't pay the extra to go ice skating. You could go to Winterville in Clapham or Winter Wonderland and have the same experience if not better for free if you don't jump on the pricey rides. Has potential, but not quite there yet. -Food options, although maybe a little unfestive, were good for me as a coeliac - I was able to get a gluten free burrito, which was a happy surprise. And tasty it was, too. - Everything costs extra - food and drink is one thing, but ice skating? Santa? I know the entrance fee goes towards the performances, but it seems a little excessive to pay £15 to look around some stalls and food stands. There is something about the Greenwich Winter Time Festival that brings out the Scrooge in me – if this was a free event, it would just about be passable but there is no way the entrance price (e.g. £15 for an adult ticket) can be justified given the limited nature of what is available on site - effectively, a few bars, foodtrucks, a skating rink, Santa and some Christmas retail huts. And most of the activities like skating are an additional cost on top of your entrance fee. The night we visited, the main early entertainment was a couple of local choirs (although the roaming ‘Christmas Crackers’ were really good fun). The night also started off poorly with no directional signage whatsoever from the Tube and Cutty Sark (this is Events Management 101 – basic, basic stuff) – so we ended up walking the wrong way around the entire perimeter before we found the entrance (for the record, head to the right when you reach the perimeter fence near the Cutty Sark). Given our experience, I wouldn’t be surprised if visitors (and also the vendors) ask for a refund. As other festive sites do this so well (like Winter Wonderland and to a lesser extent, Winterville) and based on the current online reviews, I can’t see Greenwich Winter Time Festival returning in its current form next year – which is a shame, as the location has such potential. The Greenwich Winter Time Festival was like a John Lewis Christmas ad for me...It has the festive props (music, Christmas lights, Santa), but truly all they want is your money. ·I know it’s my fault that I imagined the setting somewhere more scenic (between the Naval College buildings), but the scenery was a disappointment. I couldn't see anything of the beautiful “signature” Greenwich…it could have been anywhere. ·The event in general was pricey for me…You have to pay an entry fee, then pay if you want to use the ice rink, then of course food and drink(s). The market stalls sell pretty stuff, but not for my budget (designer cushion for 50£? )…And again I’m not the target customer... but 5£ to see Santa??? ·The ice rink was quite bumpy at the back what made the clumsy skaters’ (like myself) life harder. ·It was a bit hard to find the entrance as coming from the Cutty Sark’s direction I hadn’t noticed any signs. Overall: it’s a new festival so I would give it a few more years to go and try it again. This festival is still finding its feet, that’s for sure, but I can’t say I didn’t enjoy my visit because I really had a wonderful time. That fact it’s not overly Christmassy is a positive in my books, it gets a bit boring feeling like your having the festive season forced upon you. Here the balance is perfect. A few Christmas elements mixed in with general enjoyment and entertainment means that the whole experience is a lot more relaxed. The ice skaters are a pleasant touch and I do agree iceskating should be included in the ticket price which is a little high at £15 but it’s a fun and safe place for people of all abilities to give it a go! I think the selection of stalls was lovely, if a little limited, but everyone was happy to help and talk to you which just adds to the experience. And as for the food, I very much enjoyed my pulled pork bun followed by cinnamon topped churros. I think it’s got a little bit of fine tuning still needed but I also think it’s well worth giving it a go. There are a lot of negative reviews for this and sadly, I have to agree with some of it. £15 to get in is VERY steep. There is some entertainment going on such as figure ice skaters, carol singers and a silent disco but I don't think that was worth the extortionate entry fee. There wasn't much variety of food stalls, they weren't very Christmasy and the market next door does better and cheaper food. The figure skaters and choir were enjoyable to watch and the mulled wine/rum hot chocolates (doesn't sound like it would work but it definitely does) were amazing. That being said, I don't think I would pay £15 (£20 if you want to ice skate) to get in and probably won't be going back until they have figured out their pricing strategies. The festival is a more intimate and upscale affair compared with some of the bigger commercial Christmas festivals around London. It has a relaxed atmosphere, where you can enjoy a glass of wine or two among friends, stroll through the boutique markets and catch a live performance. The ice rink is a nice addition though certainly not a focal point of the festival and appeared to be geared to children. For me, the biggest selling point of the festival was the beautiful setting in the historical grounds of the Old Royal Navy College. It truly adds to the magical atmosphere. Being one of the few festivals in London charging an entry fee, I did expect more for the ticket price, however the festival is still in its infancy and I look forward to visiting again in future years!